The first Kangal litter in Brittan was produced in 1967. 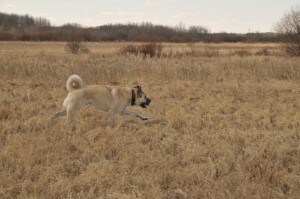 In the US, the first purebred breeding programs for Kangal Dogs began in the early 1980s. Internationally, Kangal Dog is recognized by the United Kennel Club in the US, and by the national kennel clubs of South Africa, New Zealand, and Australia. Moreover, many Kangal Dogs are being bred in Germany (mostly by immigrant Turkish workers). Some are registered as Anatolians- this being the only registration option open in Germany; however, most are unregistered. The Turkish Kennel Club has been petitioning the FCI for recognition of both the Kangal Dog and the Akbash Dog. In Namibia the dogs are being used to help protect from cheetah attacks, by guarding farmer’s flocks. Kangal shepherd dogs have been bred to stop cheetahs from taking livestock. While depriving the cheetahs of occasional meals, the dogs have been doing them a good turn because, with the livestock left in peace, farmers have little reason to persecute the big cat. Almost 300 Kangals have been given to farmers in Namibia since 1994 by the Cheetah Conservation Fund (CCF) and the scheme has proved so successful that it has been extended to Kenya. In Namibia the dogs have been sent to live at 275 farms in the areas where livestock most frequently fall prey to cheetahs. During the past 14 years the number of cheetahs killed by farmers is calculated to have fallen from 19 per farmer annually to 2.4. Livestock losses have been cut significantly at more than 80 per cent of the farms where the dogs have been adopted. Of the cats that are still killed by farmers the great majority are attributed to specific attacks on livestock instead, as was the case previously, of being tracked and slaughtered whenever they came close to a farm. Anatolian Shepherd Dogs are also being used in South Africa which is home to less than 1,500 cheetahs. Free-ranging cheetah are at risk inside protected areas from larger predators and most of these enigmatic animals range freely across commercial farmlands where they come into conflict with livestock farmers. An abundant source of unprotected food (sheep, goats or calves) provides predators with an easily accessible resource, which they do not need to hunt. This food source will encourage predators to a farm and assist in their successful breeding resulting in an unsustainable growth of predators. Cheetah, being diurnal, are many times sighted by farmers and inappropriately blamed for all livestock loss resulting in many being trapped for removal or worse, removed by lethal methods of control such as indiscriminate poisoning, hunting and trapping. This often results in the removal of beneficial animals such as bat-eared fox, aardvark and raptors and does not target the problem animal. Hundreds of years of using these methods has not been successful in reducing loss of livestock to predators but has seriously threatened the survival of the more charismatic species, such as cheetah. The initial pilot initiated in 2005 has demonstrated effectiveness on African farmlands. South Africa is the third most bio-diverse country in the world and farmers have a key role to play in preserving this. The Anatolian dogs, by working with the farmers, help to promote cheetah conservation on the farms where they are present. To date this program has demonstrated a remarkable reduction in stock losses experienced by farmers with Anatolian Shepherd Guard Dogs. To whome it may consern, I am interested in the Turkish Kangal, could u please provide me with reputable breeder information in South Africa, (Gauteng). Thanks! Hello i am farming in the Karoo, jusing anatolians for more than 6 years. every year i lose my dogs due to neighbrs poisining them, its the only way i can make my sheepfarming working. Where can i find a breeding pare to bred my own puppies to have backup dogs when mine get killed.